Day One? a three-and-a-half hour mountain bike night ride with the Interval tee layered under a VRLite top. Hilly, sweaty, a little muddy too. The tee came off damp and spent the night airing happily in the bathroom. Me: smelled surprisingly fresh, maybe a minor hint of arm-pit but that's as likely to be me as the tee to be honest. Her: Do I really have to do this? Prolonged sniffing. 'You just smell like you'. I think that's a good thing. So far, so good. The tee is now back in service and typing away happily in the OM editorial shack. I am at peace with the world and the tee. Well surely it cannot work out as well as a Merino base layer can do for long trails? I guess not until someone proves it does do as well, 'in battle' out upon a long trail, as it were there. I doubt it'll be as pong resistant as merino, but then it wicks better and dries faster. We'll see, I guess? I'm a big fan of lightweight merino for trekking and general all-round wear. Linking in to part two of this fab article here on OM. 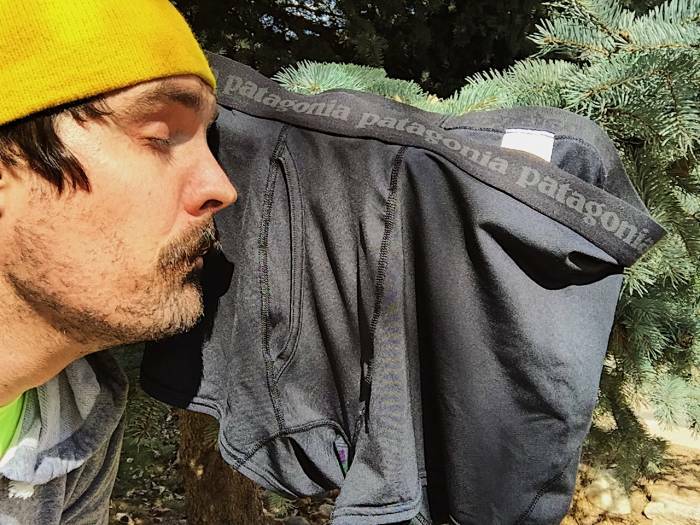 A brand new stink test here on Patagonia underwear.